One of the things I love about stories is that they can help us explore liminal moments in our lives from the relative safety of a seat on the bus or while propped up in bed. Quest narratives allow us to cross over from adolescence to adulthood without actually getting singed from a dragon’s fiery breath. (Though memories of the middle school cafeteria may give a dragon a run for his money!) Stories that transport us across seven seas in seven ships can give us courage while we make our own journeys to a new home, heal a broken relationship, or enter a new phase of life. Myths, fairy tales and other stories of the “folk” can shine a light on the path we choose to follow–even when it’s a path that leads from one life to the next. Here is one such story about a woman named Tía Miseria who thumbs her nose at death and, by doing so, brings something unexpected into the world. It is a story about a feisty, unconventional woman that I love to tell! My version here is based closely on the ones told by Harlynne Geisler and Olga Loya. Once, when I told “Tía Miseria” to an audience of students at Earlham School of Religion and Bethany Theological Seminary, one seminarian named Andrew drew a picture while I told the story. Later he shared it with me. 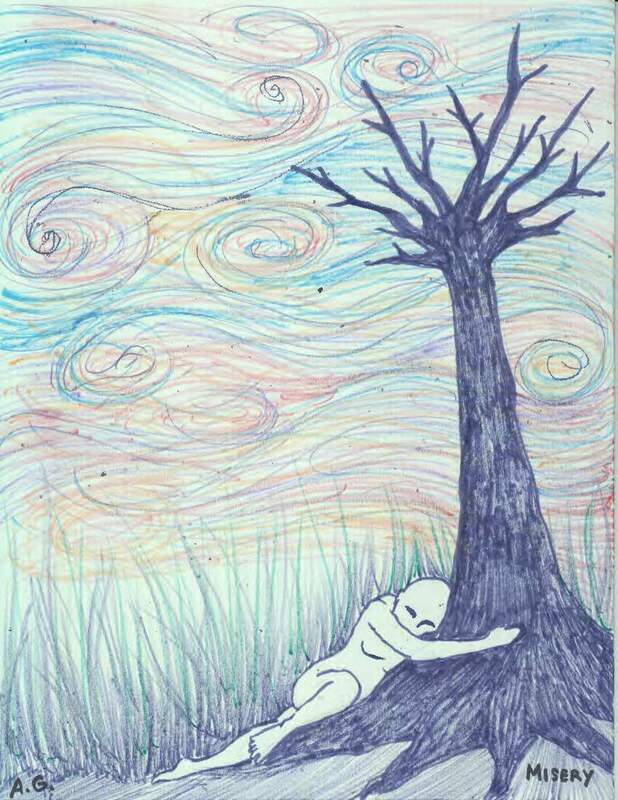 Rendered in colored pencil, a lone, naked figure embraces a bare tree whose branches extend into a sky of swirling rainbow colors. One word is written in between the tree’s roots: misery. “Miseria” can be translated as “misery,” but I like to think that it is also closely related to “misericor’dia,” or “mercy.” In Andrew’s stunning picture, just as in the folktale itself, we are not given answers. Instead, we are asked to think about the nature of misery, the place of mercy, and the relationship that can spring up between the two. The story itself becomes a tree of mercy, offering shelter while we try to puzzle out lives that may feel like equal parts of bizarre comedy and mundane tragedy. I like to think Tía Miseria is sitting under the tree with us, too, ready to hand over the perfectly ripe pear. That is, as long as we ask politely. *If you are having trouble with the media player, you may also listen to it here. An awesome story, beautifully told.